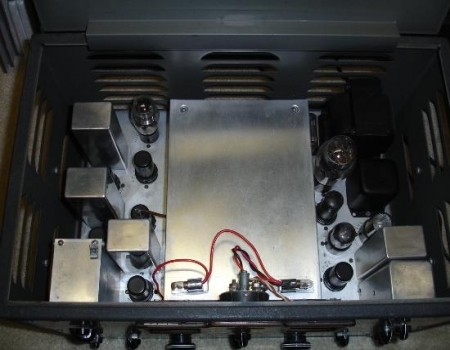 The Hammarlund HQ-129x is a Single Conversion Super heterodyne receiver with 11 tubes covering 540 - 31000 kHz. The modes for this receiver are AM and CW/SSB. The tubes and their functions are as follows, 6SS7 = RF Amp, 6K8 = Converter and 1st Detector Oscillator, 6SS7 = 1st IF Amplifier, 6SS7 = 2nd IF Amplifier, 6SS7 = 3rd IF Amplifier, 6H6 = Detector and Noise limiter, 6SN7GT/G = 1st Audio Amplifier and S-Meter, 6V6GT/G = Audio Amplifier, 6SJ7 = BFO(Beat Frequency Oscillator, 5U4G = Rectifier and a 0C3 = Regulator. The front controls are as follows and starting at the upper left, On/Off Crystal selectivity, Phasing, Send/Receive, Sensitivity, Main Tuning, Band selector, Band Spread, Audio Gain, On/Off Limiter, Manual/AVC/BFO, Beat Oscillator. Left out of this line up is the Antenna Compensator which is located just about between the two frequency dials. This receiver incorporates Flywheel Tuning which has a very solid feel to it. The band selector ranges are as follows, .54-1.32, 1.32-3.2, 3.2-5.7, 5.7-10, 10-18 and 18-31 MHz. The band spread is used for the 80, 40, 20 and 10 meter bands. 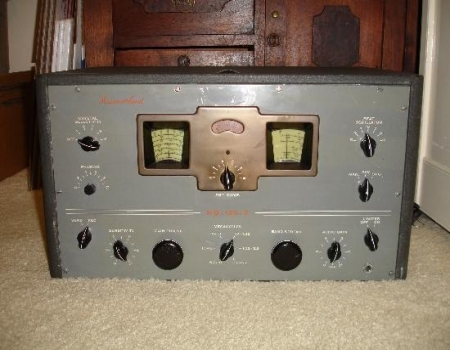 The Hammarlund HQ-129x is often found with larger, user-supplied, tuning knobs. 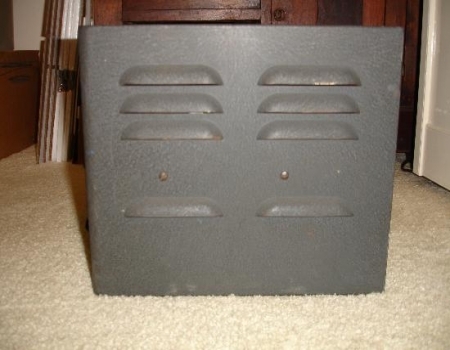 This receiver is a great medium wave performer and a ton of fun to operate. Early production runs featured the Hammarlund name and model in red lettering. Most units had all the front panel labeling in white. Some late production units had black lettering for the name and model number. The HQ-129x is the post war successor of the HQ-120x. The HQ-129x is often paired up with the Hammarlund Four-20 transmitter. The trim around the two dials should be a blackish wrinkle paint finish instead of the bronze color as the photo here shows. This receiver weighs in at 47 pounds. 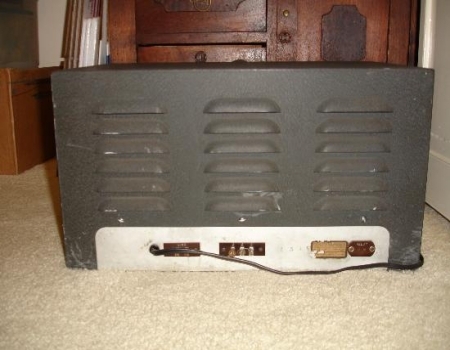 The photograph on the left is of the side of this receiver and shows the numerous louvers to aid in ventilation. The picture on the right is of the inside with the lid raised. I did the steel wool elbow grease thing on the inside. Notice also the red wires for the lights I replaced during the restoration. The originals had the cloth insulation and were badly cracked and dry rotted. 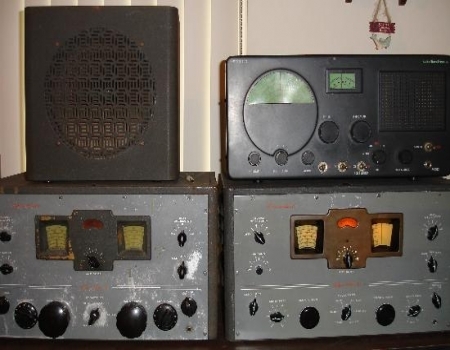 A pair of Hammarlund HQ-129x radios and speaker here in the shack. Plus a Hallicrafters that wanted to sneak into the picture as well. Not to be out done by this Hallicrafters, the HQ-129x on the right is powered on for the photograph.